One day, our founder decided to go to attend a SBA training program. They taught him about a business plan, and recommended that he answer the RPs requested in DARPA and DoD SBIRs. So I got t read a lot of SBIRs. And, I got to waste time writing proposals. Reading SBIRs is one thing. Replying to them another. Our technology was about decision making in loosely coupled networks. This was back in the day before Microsoft hijacked the term loosely coupled network. DARPA had inferential warfare in mind. They took the OODA Loop and made it formal. Then they looked at the individual commanders doing their OODA loops from the perspective of the commanders of those commanders, and the providers of external services for things like artillery, and air strikes. Lags were involved as were conflicts of interest, so some other researchers came up with solutions built around shifting points of view. Nice stuff. Stuff you’ll see executives asking for in about a decade as the officers trained on the stuff move into the private sector. An army SBIR was asking for tools that would give them the bigger picture of large-scale coordinated hacks. This involved masses of streamed data from server logs all over the network. In discussions with the lead for this particular project, the lead insisted that what he was asking for could not be done. Well, the company I worked for before I got involved with this founder could do it, but probably never thought to sell it to the federal government sector, because of the overhead involved. They got acquired so the VCs could leave, and the technology vanished. The acquirer had competing technology that couldn’t do the job. These SBIRs are research projects, phased research projects. Get into Phase I, or forget about it. In another discussion, we were looking at a later phase of a project, this before we learned not to do this, and found that SBIRs are awarded to academic researchers, not technology startups looking for clients. So it boils down to SBIRs not being the way to go. After an SBIR project, those academics can form companies that sell the SBIR technology into the private sector, but the private sector won’t startup within one of these projects. Subscribe to SBIR lists, read SBIRs, get a grasp of future technologies, do your research thing, know how your market populations will change as the technologies in those SBIRs are adopted. But, don’t write proposals in response to SBIRs. There are companies that respond to SBIRs, but they were set up to comply with federal service acquisition laws. A bare bones software startup does not exist in that world. I’ve owed this blog post to one of my twitter followers for a long time, so finally. 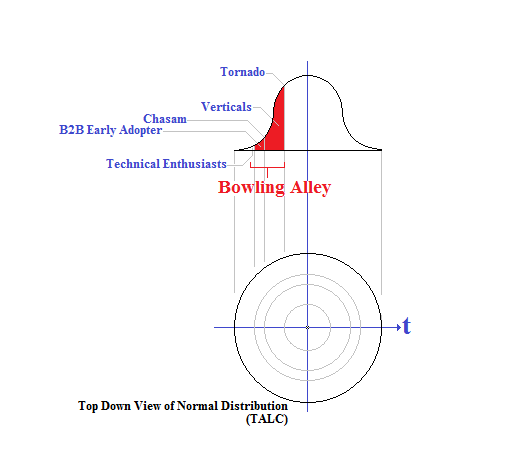 The bowling alley is a place on Geoffrey Moore’s Technology Adoption Lifecycle (TALC). I remember it as the first or second of his books on the topic that I read. The other one was “Inside the Tornado.” The bowling alley book is apparently out of print. I may be totally hallucinating, but I think I had it physically in my hands. I read those two before I ever read “Crossing the Chasm.” I read a lot of the same stuff over and over again from one book to the next, but Moore follows Tom Peter’s practice of giving away your methodology while constructing a new one. After the dot bust, Moore moved into the more orthodox regions of standard management practice–stuff startups can’t do, or at least startups that are fostering the adoption of a discontinuous innovation–something the internet is not today. The internet is a well adopted technology sitting in the late main street and later phases of the TALC. That the internet still fits into the TALC along with smart phones and the cloud tells us that the TALC is still relevant. Even if nobody pays attention to it these days. One thing we hear is how risky innovation is, particularly discontinuous innovation, the kind of innovation that creates new wealth, new categories, and new companies. The bowling ally is a risk reduction mechanism. Risk be damned. Yes, if you do the orthodox pro formas and business plans, you’re boat gets sunk. The risk manifests itself. Management practice inserted that risk. Thinking economies of scale inserted that risk. Stage gating on a guess, or gut inserted that risk. Well, stop it. We can mitigate our risks via the bowling alley. Moore’s bowling alley starts with the early adopter. That early adopter runs a business in a particular vertical. That early adopter runs the whole business, so you can span the enterprise, or focus on a few business or functional units. You don’t want to do anything horizontal for the early adopters, since you will be selling his application into his vertical. The early adopter will pay you to build his product visualization using your technology. You won’t need VC money yet. You could potentially bootstrap. Given you know the vertical you will eventually enter, stage gate the early adopter engagement on that vertical. Is there enough seats and dollars in the vertical? Are you providing real competitive advantage to the eventual economic buyers in the vertical? Is there a real market, or is the use of the application driven by laws requiring use of the application, or reporting? Be careful here. Is there enough IT horizontal seats in the vertical? You’ll need those IT people, because the very last thing you do in the bowling ally is enter the tornado where you are selling to the IT horizontal. You get them on board during the vertical. Now, is too early. Moore suggested engaging the technical enthusiasts in the vertical you are entering, as they might surface an early adopter willing to use your technology. In the figure below, I’ve color coded the bowling ally. I omitted the relevant technical enthusiasts. I’m using a overhead looking down view of the TALC. This will enable us to see adoption and sales of our products as vectors, and in the bowling alley in particular, a collection of Poisson games, games or unknown populations. Moore uses a normal, but after seeing a visualization of startup financial data, I’ve seen it as a Poisson distribution tending to a normal. This was irrespective of the bowling alley. You don’t see companies going through the bowling alley. I interviewed at one, the one that created the idea of demand pricing. The airline industry was their first client, their first lane in their bowling alley. They had other clients as well. Yes, companies do this. They do it to productize and drive the adoption of their discontinuous technology. You wouldn’t do this for continuous innovation/technology. You do see companies getting stuck in a highly profitable vertical. PeopleSoft is one example. Doing the bowling alley is a slow process. You want to do eight custom development engagements for early adopters. To keep your intellectual property, you’ll need to give the early adopter something. Moore talked about a two year period of exclusion. That’s two years after delivery where you don’t sell the application. The early adopter wanted a competitive advantage, and gets it during those first two years. All is not lost, since you can have a very broad scope, deliver functionality inductively, deliver functionality as minimal marketable functionality, and engage in management consulting to help the client maximize their competitive advantage. You’ll have plenty of time with the earlier lanes of your bowling alley. Later, you won’t. In the next figure, I’ve illustrated the bibliographic maturity process as feeding the technical enthusiasts, some of whom may advocate attractive technologies to their business unit executives. Again, not to IT. IT will not buy never adopted before technologies. When productized, business unit executives do buy applications that do what they need even if the technology is discontinuous. Of course, these executives are the least risk adverse executives around. Notice that the outer edge of the technical enthusiast phase is gray to indicate that this edge is porous. The outer most red segment represents the technical enthusiasts that can advocate. 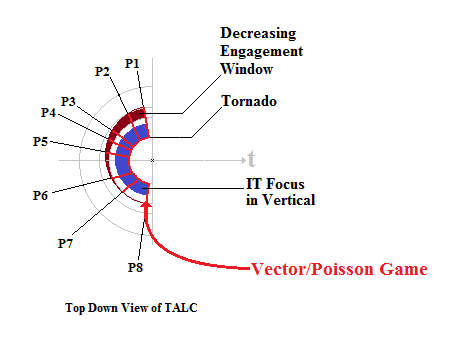 The inner segment that is not red is the tornado and IT horizontal. The bibliographic maturity process is shown to the left. Since the 60s, we have allocated basic research to universities. Basic research is the kind that breaches physical constraints that are at the core of discontinuous innovation. Ideas move via tennis shoes and show up at the perimeter of a firm where they are subsequently brought in house and commercialized. When stage gating, you should also consider the spread of your early adopter engagements across the industrial classification scheme that economists use. Moore suggested eight early adopter engagements each in a different industry. Scattering these engagements across the classification scheme enables you to move up and down the vertical with minimal effort, and it enables you to sense economic events via the normal operation of these eight businesses. Different industries propagate economic events at different rates. While one of your lanes closer to the event slows down, all of your lanes will not slow down at the same time. The figure shows both the movement and sensor net effects of having a collection of well placed lanes. Eight engagements are taken on serially, one after another. Doing more than one at a time requires us to grow our headcount and capabilities. In the next figure, I start out with one engagement or lane in the first year, doubling the number of engagements in the second year, and doubling the engagements again in the third year. Since my aim is to continuously do discontinuous innovation, I transition to another discontinuous technology once my eight engagements for a given technology are underway. The figure shows subsequent technologies. The figure reflects a very clean process where reality is messy. Now, imagine wrapping the above figure around the radius of the tornado and IT horizontal. Each of the products would be represented by a vector extending from the technical enthusiasts and ending at the tornado. We ended up with the following figure. In this figure the products are scattered around the industrial classification scheme. Thick red radial lines represent ongoing product development. The brown areas show how the radials get shorter and shorter as we approach the last engagement or lane in our bowling ally for a given technology. The last engagement will not be waiting around in its vertical. This decreasing engagement window happens because we will combine all our products into a single application that brings all the users with it as it enters into the IT horizontal. The blue areas illustrate where we begin to focus on the IT horizontal. The red radials represent our vectors and the Poisson games associated with them. It’s messy. There is a lot of work involved in getting across the bowling alley quickly. The goals change. Ultimately, the bowling alley sets you up to win your tornado competition and win your market leader designation, and market power market allocation that grants you a near monopoly for years to come. Don’t listen to the siren’s call of risk, risk, risk. Mitigate those risks by taking the time required, and putting in the effort to cross the bowling alley. The day after I posted the person that wrote the blog post, “Pioneers, Settlers and Town Planners,” Simon Wardly told me that in his opinion there was no correlation between his Evolution concept and my take on Moore’s Technology Adoption Lifecycle. So I’ve wrestled with this for a bit now. In his tweets, he mentioned evolving practices. So I saw that as Moore’s task sublimation, a requirement for moving from early main street phase to late main street phase, from serving geeks to serving consumers, from free to paid services. A lot of things have to evolve to move from the phases on the left to the phases on the right. SAP had to eliminate their dependence on professional services to move into later, more pragmatic populations of later adopters. Marketing content similarly has to evolve to fit same. So I was still seeing this evolution as from one phase to another, aka inter phase view of the TALC as a process or network. Still, his tweets on the matter were insistent. So it came to me. I was gently reminded of all the disappointing things I see in internet companies today, the intra phase view. My old Slideshare, “So you don’t have a Market, Great!” hinted at the fact that most innovations are not disruptive and do not always start at the beginning of the TALC and flow through the phases. Verbiage like “Early Seed Stage” make it seem like they do, since early seed stage was something specific back before the internet. Now, it just means your first money, regardless of the underlying innovation. These days there are no underlying innovations. We are replicating adopted stuff. We are starting in the late main street phase and not moving across the TALC in any real sense. A bank should be funding the stuff we are doing today. Wardley insisted that there is no correlation between his Evolution and the TALC, because the way he sees it, his evolution can happen inside a single phase of the TALC. This has nothing to do with the value I saw in Wardley’s maps and mapping technique. I think that product managers will find it useful. But, there is that other view, the intra phase view. Thanks for getting me there. I know that most product managers are doing continuous innovation, aka evolution, within a single phase of the TALC even if other language pops up from time to time. Wardley’s s-curve view sums up an argument that Rich Chapman had with product managers back in the 2009 timeframe about how a web service doesn’t need a product manager. Where the s-curve flattens, the value of a product manager likewise flattens. There are webservices out there today that have been around forever and have not changed in forever. They still generate income for their owners. That was Chapman’s point. He wasn’t wrong. Yahoo is another such service. Mayer’s would be better off leaving it alone, and trying to find a new technical discontinuity that could be overcome and serve as the genesis of a new category. Search is so over. I’m not so much against product managers having jobs, but more importantly, product managers finding the steep side of the curve, because those jobs are more interesting and fun. That webservice that doesn’t churn its code, does put out brand new games every year. They just won’t go back and fix things in the old games. They won’t spend programmer time where there is no particular upside. When you build a conceptual model, do realize that every concept is subject to adoption, has a lifecycle, and has an S-curve. A concept is never static. They evolve. They evolve whether or not they are technological or otherwise. We are moving whether we want to admit it or not. Much of the constant change mantra is nonsense, because non-technological change is very slow, and technological change is very noisy in your face, but much slower behind your back. Change includes churn. Don’t churn. Go with my recommendations in my prior post. There is much to be learned from Wardley. I’ve built my product strategy practice on the Technology Adoption Lifecycle (TALC), the thing Geoffrey Moore talked about in his series of books. I tied it together with other validating conceptualizations. I used it to build product roadmaps that were maps, rather than the lists that we call product roadmaps today. They were maps of populations and concepts, layers in the GIS sense. I did this back in 2002 or so. The early adopter is a member of the vertical we decided to enter. The vertical of the verticals in Moore’s bowling ally. More globally, these two view are looking at the same thing, evolution, an evolution of discontinuities in populations and the underlying technological platforms. I bolded every other item in the technology view, and the marketing view to tie them together. So we have lots of models of evolution. The mantra of constant change is false. If you understood business rules from a management perspective, rather than a DBA perspective, you’d see that letting management change their own rules would reduce programmer involvement, which in turn make most change disappear. Change in a population is slow, so automated content doesn’t change all that much. The automating technology changes much faster. Dividing automating and automated helps, so software architects should leverage these as layers; likewise, marketers. These same architects could do the same likewise with the other evolutionary models. After reading @swardley article, I’m now reading his blog in it’s entirety. So the next post, led to “On Services,” which led to another view of evolution, the Wardly Map, a physical map. See Simon Wardley’s video on Wardly Maps. Wardly added the TALC phases to value chain mapping. We are always talking about value, but it’s a limited discussion. Value is a vector that happens to reach through your interface. When selling to economic buyers, the point is economic, aka far away from the interface. The user helps the economic buyer reach their economic goals. In value-basing, the goal is to extract say 15% of the economic value created by the economic buyer and users enabled by our products. This makes the preaching around listening to the customer a real mess. Agile developers would hardly be talking to the economic buyer. Hell, we hardly do so either. Value chain mapping maps out processes, needs, users, and technological elements reaching across the reach of the economic goals. The Wardly map is a great tool for this purpose. I never understood the list perspective of the product roadmap. I’ve written about geographies and geometries, the stuff of maps in the GPS sense. Bach when I was the product strategist for NHDS, Inc., I built the map reflecting the populations and technology. I did both the marketing and technology views on one map. Have fun. Leave some comments. In other posts, I mentioned a carrier and the carried. A media is composed of a carrier and a carried. We could be talking radio as a media, or a canvas and water paint as a media. The media being the carrier or the physical means. The sound we hear while listening to a radio: the DJ, the music, the advertisements; or the painted portrait or landscape as the message. The message being the content carried to by the carrier, the media. The carrier and carried, the media and the message are taken together inseparable in McLuhan’s quote. They are beat together and interact to become one thing composed of many things. Media turns up in the oddest places: software is a media, and in the technology adoption lifecycle. Now when we automate a media like video in software, it’s obviously a media/medium. Or, when we develop a game, it too is obviously a medium. We even find ourselves in media categories competing with other media in the hopes of a big hit. We engage in a hit-based, front-end of the long tail, y-axis convergence, business that fundamentally doesn’t look like the software industry, or what we formerly called “tech.” Monetizing on display ads affects our businesses similarly. As a business, we are the business our monetization puts us in, not necessarily the software business. Display ads is a media proposition. The size of your audience matters more than your code. But, walking away from that, ordinary software is a media. Software as a media is composed of carrier components both hardware and software, and carried content. It’s the familiar division between “What” (carried) and “How” (carrier) But, the division is messy. Too many people get this wrong, even when objects, data structures, coupling, and cohesion try to force some architecture on the issue. At the level of code the question becomes which is which? The index used when iterating through a list is carrier; the length of the list, possibly carried; the content of the list, carried if it originated in non-carrier domain. If the list is a list of commands originating from the software itself, call it meta carrier, so it originated in the carrier domain. What is which is complicated. Software as a technology gets adopted over time. Geoffrey Moore’s books, all of them, not just Crossing the Chasm, applied the Rodgers’ Diffusion of Innovation framework to the technology marketer’s work of creating a category and working through that category’s lifecycle. A category is created only for a new discontinuous innovation. Moore would have us begin at the beginning. Most of us don’t. These days, with the internet or devices, we start in Moore’s late main street phase. We start out post geek, where free is not a culturally driven demand, where customers will pay to play, where we, returning to the software as media model, are delivering the carried. The developers typically remain focused on carrier exclusively. Marketing should be focused on carried. The category’s lifecycle phase is focused on the carried. If we started in the beginning, we would be serving the technical enthusiast, a carrier focused bunch. Then, we’d move on to productize our technology by building one client’s product visualization. That client being the B2B early adopter who expects to create a competitive advantage, value in depth, well off the interface. That client is a member of the vertical market we will serve later, both of which are carried focused. While developing this client’s application, we would include IT roles and spend increasing amounts of time on IT’s needs, carrier. We would have to split our efforts, so one team would remain carried focused, while another would be carrier focused. Then, after repeating this Early Adopter, Vertical, IT Horizontal sequence over and over in the bowling ally, we would cross the tornado in the early main street, where the focus would be carrier. Then, we would transition to the late main street that we discussed earlier. The phases are not short. That saves us. There is more to these phase shifts than just what happens with the software as media model. But, relative to the software as media model we move from carrier, to carried, to carrier, to carried. In the latter, we will end up seeing some of our technology commoditized, in which case, we will return to carrier to rectify that. I covered the phase-driven changes, as they apply to the software as media model, a long time ago in a presentation, So you don’t have a market? Great! So what brought this up tonight? A review of linear algebra demonstrated this same split between carrier and carried, this same split exhibited by software when seen as a media. In integration, we come up with an equation of a family of equations like y=Ax+C, where C represents some initial condition that selects a particular equation from the integrals family of equations. In linear algebra, non-square matrices contain leading and non-leading columns. Those non-leading columns are set to a parameter. The leading columns contain variables the solution of which define a family of solutions. By providing specific values to the parameters, you select a specific solution from the family of solutions. The leading columns give us a class; the non-leading columns, an instance. Taking this back to the software as media model, the leading columns are carrier, and the non-leading columns are carried. Those leading columns at like the control points of a Bezier curve. You can add control points without weighting them, without changing the curve. Later, with shock and awe, weight them, bending the curve-changing the carrier’s reach. This all fell out of a discussion of row reduction. In a matrix undergoing row reduction, rows containing only zeros are moved to the bottom of the matrix. This reminded me of the distinction in game theory of dominated strategies, which don’t matter, and an be ignored when thinking about world size. Commoditization is one of those black swans where the world size shrinks and once discontinuous technologies become dominated having lost their differentiation. The rows hint at a stack with the top of the stack being the being the ground plane of the x-axis. Well, enough of that, except it gave me the vision to see the carrier and carried layers of a media, software as media, a little clearer. Leave a comment. You are currently browsing the Product Strategist blog archives for January, 2015.